The Russian Ethnographic Museum was founded in 1901 as a branch of the Russian Museum. 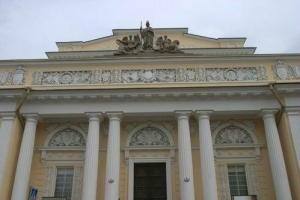 The right wing of the Mikhailovsky Palace was rebuilt in 1900-1911 by architect V. Svinyin in neoclassicism style for the collections of the Ethnographic Department. The basic expositions consisting of the materials gathered before the Revolution of 1917 were opened to the public in 1923. In 1934 the Ethnographic Museum started to function as an independent one. Later its collections were enlarged, and after the World War II the museum got its modern name. The Ethnographic Museum's collections are displayed in 24 halls. These contain ceramics, textiles, jewelry, metal and wooden works, national costumes, as well as different attributes of rituals and festive ceremonies. The museum also boasts numerous photos that help visitors to visualize calendar, wedding, funeral and other rites, many of which are of magic character. The visitors can see with their own eyes typical buildings of different regions of Russia. Sectional houses of the population of Central Asia, small many-tier stone buildings of Caucasian mountains, timber houses and more constructions are on display. The majority of the models are full-sized. The special storeroom of the museum contains national jewelry, objects of cult and armory made of precious metal, pearl, precious and semiprecious stones. The majority of the exhibits are really unique as the secrets of their making, which had been carefully guarded by the masters of the past and handed down from the teacher to the pupil, unfortunately were lost.